The population of emigrants hailing from Latin American and Caribbean nations only saw 7 percent growth between 2010 and 2017, lagging behind a global emigration increase of 17 percent in the same time frame, the Pew Research Center reported Friday. From 1990 to 2010, Latin American and Caribbean nations were the fastest-growing source of emigrants in the world. Those numbers have since dropped dramatically, largely because fewer people have been leaving Mexico. Pew found that migrants’ destinations have shifted since 1990 as well. In 2017, Argentina was the top destination for the 16 percent of Latin Americans migrating within the region. Between 1990 and 2017, the number of Latin American migrants living in Argentina rose from 830,000 to 1.8 million. Lopez said this year’s record inflation could impact the number of Latin American migrants who make Argentina their destination. “With high inflation and the challenges that the Argentina economy has faced in the year particularly, it’s unclear how many migrants might move there going forward… We’ll have to wait to see,” Lopez said. The United States remains the top choice for all emigrants from Latin American and Caribbean nations, receiving 67 percent of the region’s emigrants in 2017, not far from the 62 percent of emigrants that settled in the U.S. in 1990. Mexico’s emigrant population leveled off between 2010 and 2017, Pew estimates show. The number of people born in Mexico and living abroad was 12.3 million in 2017, compared with 12.5 million in 2010. Mexico remains the single largest emigrant population from the region. Lopez attributes declining Mexican emigration, which began in 2005 and continued through 2014, to three factors: fewer U.S. border crossings, burgeoning economic opportunities, and an aging population. “While Mexicans still make up one of the biggest groups coming into the United States, the number of crossings and the number of apprehensions is way down, it’s actually at a 40-year low,” Lopez said. 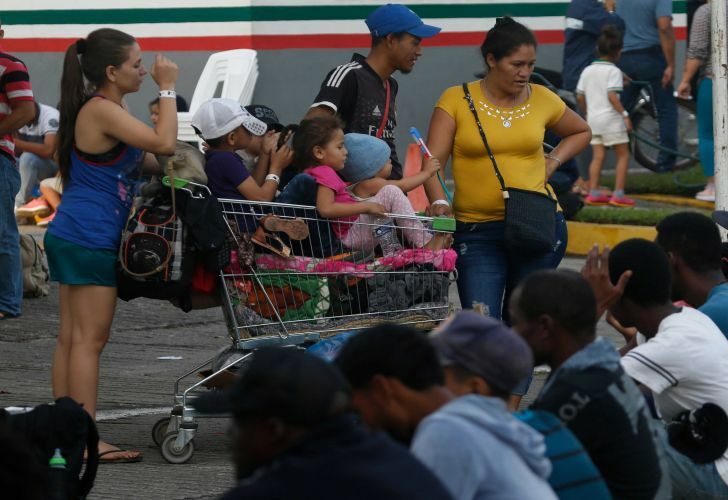 Since 2010, Honduras (29 percent), Venezuela (28 percent), the Dominican Republic (21 percent), Guatemala (19 percent) and Costa Rica (17 percent) have had the fastest-growing emigrant populations among Latin American and Caribbean nations, Pew reports. Argentina's emigration has been on the rise. In 1990, 430,000 people born in Argentina lived in different countries. By 2017, that number had risen to 970,000, with 250,000 Argentine natives living in Spain and 190,000 living in the United States. Political and economic instability, as well as conflict, violence, and climate-related events have contributed to these spikes in emigration. Lopez says the crises rocking Venezuela could drive further migration out of Venezuela, and possibly into Argentina. The Middle East and North African region (up 38 percent) and sub-Saharan Africa (up 32 percent) experienced the greatest increases in emigration from 2010 to 2017.